What’s blue and white and fuzzy all over? It’s the forest tent caterpillar, an insect that is native to North America. This tiny insect is causing big damage to Vermont’s forests. Despite their name, these caterpillars do not create “tents” of webbing like their cousin, the eastern tent caterpillar. Forest tent caterpillars can be spotted feeding directly on leaves, resting in masses on the bark, and in mid-summer their cocoons can be seen rolled up inside leaves. An infected tree will often be cleared of foliage by June. 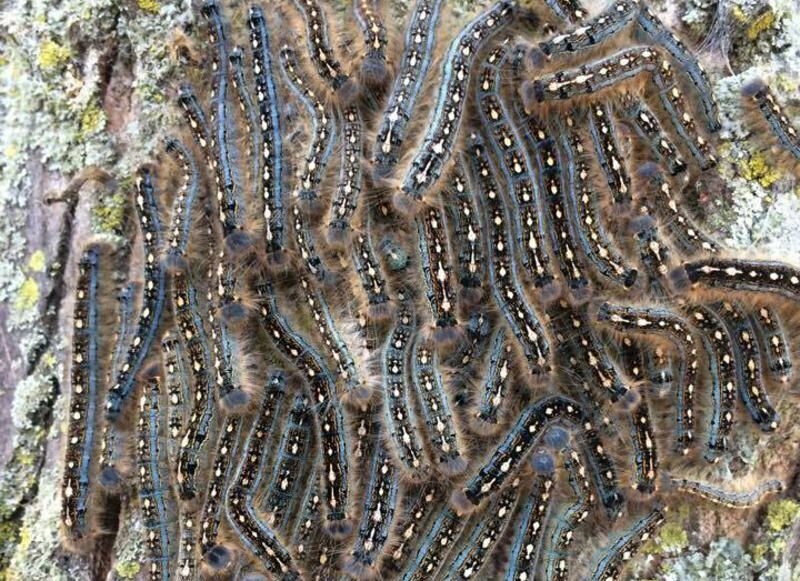 The danger with forest tent caterpillars is the potential for widespread damage to our state’s forests, according the Vermont Department of Forests, Parks and Recreation. 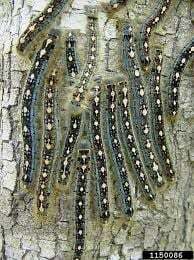 In particular, specialists there explain, these caterpillars enjoy the leaves of sugar maple and ash trees. Ash trees are an important forest product to Vermont; also, this species is already under pressure from the nonnative and invasive Emerald Ash Borer, recently discovered in Vermont. Sugar maples are both a favorite tree of Vermonters and an important one for our economy. The tree damage caused by forest tent caterpillars can significantly reduce tree growth and impact maple tapping for Vermont sugarmakers; sugaring contributes $140 million annually to the state’s economy. While the caterpillars prefer sugar maple and ash, they can be found feeding on other tree species as well. Forest health specialists at VT FPR have announced that forest tent caterpillars have now hatched, and they are again expected to cause defoliation this summer in maple forests in northern and southern Vermont. The caterpillars will continue feeding through June. In 2017, forest tent caterpillars defoliated 60,000 acres of forestland, affecting every county in the state. This level was more than double the acreage affected the previous year, in 2016. Over the past winter, VT FPR staff conducted surveys of forest tent caterpillar egg masses in 70 sugarbushes to predict the risk of defoliation in 2018. Thirty of the survey locations are at risk of defoliation this spring. Based on these surveys, landowners will be having 13 of these sugarbushes, about 4,000 acres total, treated with a certified-organic biological insecticide, Btk, (Bacillus thuringiensis var. kurstaki), to protect them from defoliation. These aerial treatments will be dependent on weather and growth stage, but are likely to occur from mid-May to early June. Most trees will survive despite such setbacks as the defoliation caused by forest tent caterpillars, even if they are defoliated several years in a row. Still, increased stresses on trees will incite decline, particularly when these problems are exacerbated by landscape and environmental factors like forest fragmentation and global climate change. Forest tent caterpillars are native to much of North America, including Vermont. Natural enemies of the caterpillar have brought previous outbreaks to an end before significant tree mortality occurred. Landowners can monitor their own trees during the months of May and June. Tell-tale signs of forest tent caterpillars can be noticed by listening and looking: Listen for their droppings falling from the tree canopy, a sound that is just like rain drops falling. Look for leaf fragments on the ground and for leaves rolled up with white cocoons inside. While trees can be defoliated by the end of June, they should refoliate during July, after the caterpillars make their cocoons. For more information on the caterpillar, the extent of it’s damage, and how to manage the pest on your own property, see a leaflet produced by VT FPR, available on their website, at http://fpr.vermont.gov/forest/forest_health.